VideoAdmin flash templates help - How to upload files to your webserver ? Home > VideoAdmin flash template help > How to upload files to your webserver ? 1) Please unzip the template after you have downloaded it to your computer. When you have unzipped the template you will see 4 folders. Namely Flash, HTML, Fonts and PSD. (see picture below) 2) Open the "html" folder. 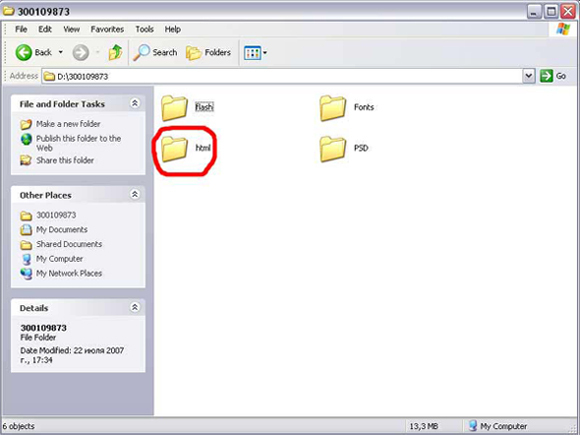 3) Upload all files to the root of your website (this is where the index.html file should be located) This directory is called public_html or WWW). You need to do this with an FTP application such as CuteFTP. How to rename buttons name ? How to insert or replace the content in the "VideoAdmin flash template" ? How to insert Video files into the "VideoAdmin flash template" ? How to make the e-mail form work ?